Born: 1963 in Belleville, New Jersey. Moved into a house with a YARD 7/1/98. Put up a vertical. 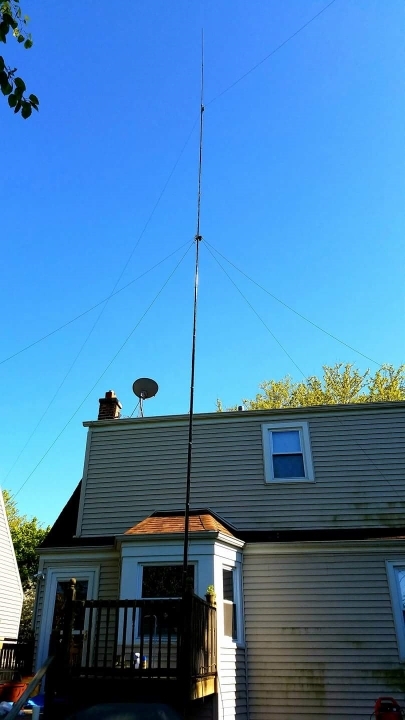 Put up 50' Universal Tower Model 16-50 on July 31, 2000!! Eritrea E30TA-Despite various DXpeditions, this one is still a tough one. 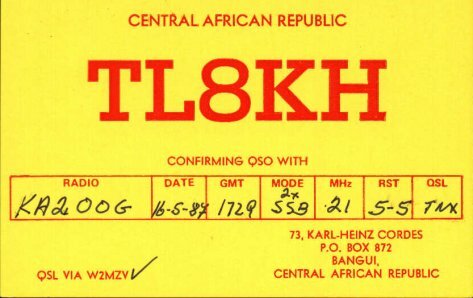 Central African Republic TL8KH-My daughter's great grandfather W2MZV was QSL manager for this one. 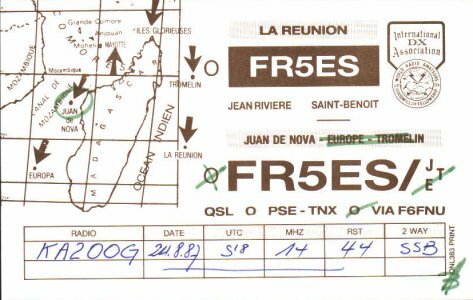 Tromelin Island FR/F6KDF/T, Juan de Nova Island FR5ES/J, and FINALLY AFTER 25 YEARS OF TRYING GLORIOSO ISLAND FT5GA-French territories, part of Reunion, but separate DXCC because of distance. Always tough to get French permission to land and operate. Kingman Reef K9AJ/KH5K-Someone told me "HOW CAN THIS BE A COUNTRY? IT'S A PILE OF SEA SHELLS!" Macquarie IslandVK0SJ-Operations from there are always just scientific operations with amateur radio as a "side issue". This one was no different. 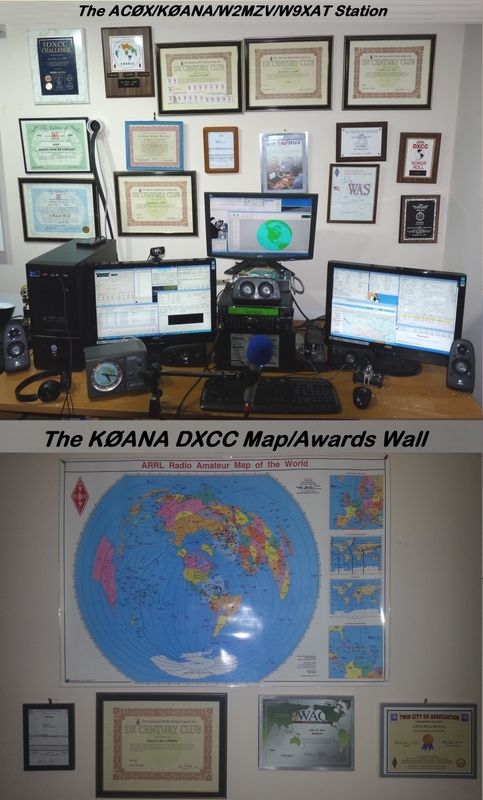 Heard Island VK0HI-A "mini-DXpedition" some years before 1997's major effort. Palau T88JU-Not particularly rare, but this one took me YEARS to get. My suspicion is that everyone who ever goes there to operate ham radio finds the island so beautiful they get distracted. 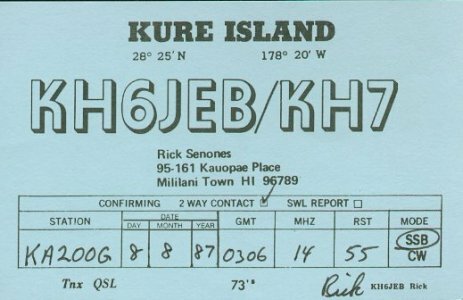 Kermadec Islands ZL8HV-Scientific operation from a New Zealand possession. Bouvet 3Y5X-Worked this one on dumb luck. He called on frequency, I HAPPENED to be there. I called him back. Malpelo Island HK3JJH/HK0M-Steep cliffs, very difficult landing. Andaman Islands VU4GDG-The Indian government has said they will not authorize any operations from this or the Lacadshweep Island anymore, so this one is a particularly difficult one. Yemen 7O1AA-I almost didn't get this card. 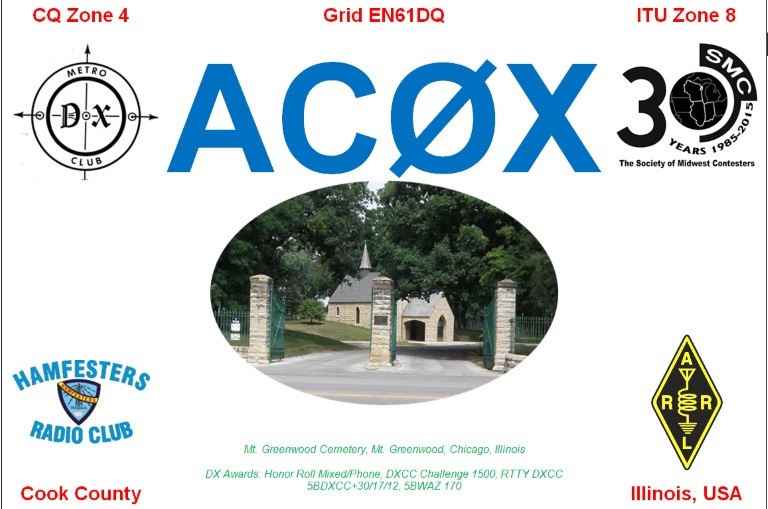 The QSL manager was from 9K, and his logs were seized during the Iraqi occupation. I finally received the card after resubmitting 7 years later. Operations from this country are rare, and often wind up having no permission to operate, invalidating the operation from "counting" for any awards. Myanmar XZ0A-The only country existing at the time that my daughter's great grandfather W2MZV never worked himself. Not as rare as it was back then, but still a tough one. DPRK P5/4L4FN-Here's one the I (and a lot of us) thought we'd NEVER have. If anything proves that DX IS, this does. Albania ZA1A-No longer even in the top 100 rarest countries, but legendary as unattainable for so long. Desecheo Island WD5BJT/KP5-Favorite place for divers, rare for amateur radio. 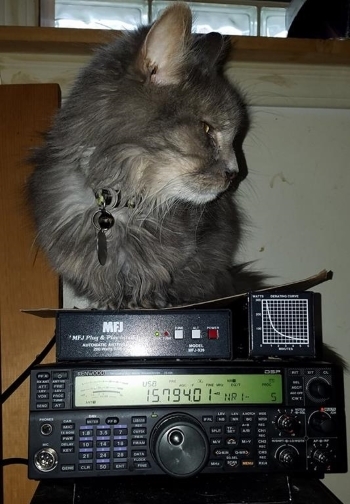 Navassa Island N2EDF/NP1-Ultra rare DX in our backyard, and it may get rarer. The US State department has refused all requests for landings there recently. Cocos Islands TI9W-Costa Rican island possession.